My first encounter with Flanagan was a serendipitous stumble upon Gould’s Book of Fish, truly one of the finest works of literature of the new millennium in my opinion, which boasts a distinctive brand of magical realism that perhaps can be said to sail in the same sea of this genre with a Murakami or a Gabriel Garcia Marquez yet remains a unique vessel of unmatched craft. Gould’s has the distinction of being the only novel that I have ever read through and then – after the final paragraph on the final page – turned back to page one and started all over, reading it straight through for a second time! 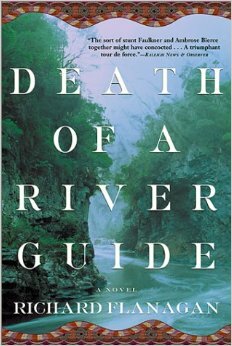 Death of a River Guide may not qualify as the same brand of masterpiece as Gould’s, but yet it handily earns superlatives in its own right, especially because it was Flanagan’s first novel. It is truly so rare as to be remarkable for a first novel to contain such kinds of complexity, characterization, narrative structure and commanding prose. I do not typically cite other critics in my own reviews, but in this case the blurb on the jacket cover – “The sort of stunt Faulkner and Ambrose Bierce together might have concocted …” (Raleigh News & Observer) – is worth reiterating because it is both telling and spot on the mark. Like Faulkner’s Sound and the Fury, for instance, Death of a River Guide time hops effortlessly, although here the very dimension of time is far more epic. Like Bierce, there is imagination, irony and sometimes horror. I might also add to that the comedic mockery of a Kurt Vonnegut and the biting sarcasm of a Mark Twain. Yet, none of it is derivative. Readers of Gould’s will no doubt detect the roots of the magical realism that come to define the latter work, the echoes of passion and tragedy that form surprising links between individuals in disparate times and places who otherwise might appear unrelated yet in fact share human experiences – often heartbreaking – that despite their distances resonate profoundly among them. It has long been alleged that during the drowning process the victim sees their life “flash before their eyes,” and this imaginary mechanism is the foundation of the narrative structure in Death of a River Guide, which also employs the more familiar literary device of the “journey motif,” as the protagonist, hapless river guide Aljaz Cossini – who has known far more misfortune than not in his life to that point – finds a rare moment of courage and purpose rewarded with the awful calamity of finding his head trapped between rocks beneath the violent waters of a rushing river, awaiting certain death yet granted dramatic yet disjointed visions that showcase his own history and the lives of those who preceded him, both immediate antecedents and far distant ancestors, which reverberate with the palpable atavism of sometimes unlikely forerunners not only of kinship but of geography and spiritual commonality. Make no mistake, this novel contains great complexity on multiple levels, and as such while the prose is quite engaging this is by no means an easy read. As in Faulkner’s Sartoris-Sutpen novels, critical details of similar but related characters over several generations are subtly revealed throughout the narrative, so I found myself more than once thumbing back through the pages wondering if I had missed a key particular that in fact had not yet been disclosed. But it is truly worth the effort. In the final chapter, I pondered whether the tale had not perhaps gone on too long after all, if I was about to happen upon some jagged flaw that would reduce the fine estimation I had for the novel thus far. Then, reading the second to the last paragraph on the penultimate page, my eyes suddenly and quite unexpectedly filled with tears. And it was not cheap. And it was not sentimental. Flanagan can do that … and he does. Death of a River Guide is a truly great novel. Don’t miss it.